As I go through the rebuild process of my engine I will use this post to keep track, and propagate, useful information sources and links. Moyer Marine - The definitive source of parts and information about the A4. I am continuing to remove the miscellaneous pieces from the outside of the engine. I have started making detailed labels and notes and pictures for each piece that I am removing since I am not comfortable yet in my ability to remember where things should go and what fasteners are needed. I have been grouping like-parts into large ziplock baggies and organizing these in order. So far this has minimized the chaos of miscellaneous bits and pieces in my [cluttered] garage. 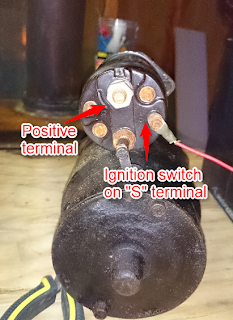 Labelled, and removed ignition wiring. I left the spark plugs in for now since they provide some protection from grime and they aren't in the way. Removed the coil from the back side of the engine. Two 1/2" bolts hold the coil bracket in place. One was missing. I will need to re-tap the corroded thread of the missing bolt before re-assembly. Removed the distributor cap. Both screws will need to be replaced. Removed the distributor. There is a bracket midway up on the distributor that holds it in place. Once the bracket is removed (single 1/2" bolt) it slides easily out. The distributor on my engine is the Delco variety, as opposed to the pre-1969 Prestolite ones. The starter is held on with two 9/16" bolts. Remove these to remove the starter. Attach a switch between the ignition terminal and the positive terminal on the solenoid. The ignition terminal is the one with an "S" beside it. Attach jumper cables from the battery to the positive terminal on the solenoid and the negative to a bolt on the body of the starter. Removing the flywheel is straight forward. Remove the front cover of the engine by removing the six 7/16" bolts around the cover. Keep track of all pieces and bolts by placing them in individually labelled bags or trays! 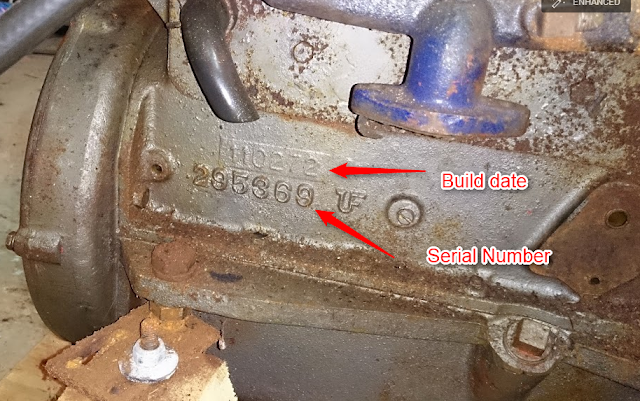 In order to find parts and details on the specific setup of the Atomic 4 it is important to know the date that the engine was manufactured as well as the serial number. Parts guides and tutorials will usually reference one of these numbers. Both are located below the breather hose, on the right side of the engine. The build date is the top number and is in the format MMDDYY. The serial number is the 6 digit number directly below. Recently I came into possession of an Atomic 4 engine. A local sailor upgraded to a new boat and had a spare engine from his old boat that he had intended on rebuilding. I am taking over the rebuild project. Increase knowledge: Increase my knowledge of Atomic 4 engines so that I am more capable of troubleshooting and repairing my boat when needed. I am not mechanically inclined but need to be more self sufficient given my desire to cruise further in this boat. Spare: Given that my current A4 is 42 years old, a spare is important to avoid lengthy losses in precious summer boat time. Upgrade: Assuming that I am successful in this build, my plan is to eventually swap this new engine with my old one to provide more reliability and performance. Not that my engine has been particularly problematic, it has been reliable for the most part. Ineptitude may be a little strongly stated, however, I have very little mechanical experience. Over the last few years I have tried to increase my knowledge of engines and marine systems and I have successfully done some maintenance and repair jobs on my A4 (thermostat and exhaust manifold were the big ones). All of this is to say that this engine rebuild will be completely new ground for me. While this is a great experience for me, it does mean that you should take my techniques, suggestions and recommendations with a BIG grain of salt. Talk to a mechanic if you want real advice! I will chronicle this rebuild as detailed as possible so that others might find something useful out of it. All of the posts will be available under the label Atomic 4 Rebuild.